Connect to Buyers that are looking at homes with your Agents. Get more exposure, drive more closings and support your agents with RatePlug – the #1 MLS integrated mortgage marketing platform that interactively plugs your rates and products into your agents’ MLS listings. In 2017, RatePlug displayed loan originator offers on more than 115 million MLS property listings. How many more transactions do you want this year? With the broadest reach in the industry, RatePlug is more than a mortgage advertising platform, more than a loan calculator, more than mortgage marketing software and much more than a flyer system – it is the most comprehensive and affordable mortgage marketing and home purchase mortgage marketing platform for lenders. WHAT CAN RATEPLUG DO FOR YOU? When you connect with your agents on RatePlug, you expand your reach in the MLS – Your rates and products are used in the MLS, which every agent uses to share properties with their customers. RatePlug automatically calculates monthly cost to acquire for each of the finance options you offer – including principal, interest, taxes, insurance, HOA, and more. Access – No other mortgage marketing platform connects you with 700,000+ agents across the top MLS networks. More than 700,000 agents across the top Multiple Listing Service networks have access to RatePlug. When you plug your rates and products into agents’ MLS listings, home buyers quickly know what they can afford. Instead of a 4 bedroom 2.5 bath home at $225,000, with RatePlug, it’s $1,375.87 per month including principal, interest, taxes, and HOA. That means better informed and QUALIFIED buyers! RatePlug automates the management of the agent and originator relationship in a 100% compliant solution. Driven by direct MLS integration, originators are alerted when your real estate agents list a property, when they schedule an open-house OR may be alerted when they place a property under contract. Even better, you can alert your agents when special finance options are available on their listings (VA, USDA, CRA, and, in select markets FHA). RatePlug’s property flyer system generates custom property flyers with your rates and products right from the MLS for your agents. Choose your layout: Multiple flyer layouts and colors to choose from. Monthly affordability embedded in flyers (includes PITI and HOA). Social media posting: RatePlug also streamlines social media posts with property specific affordability calculated for every MLS listing. Manage everything from a central dashboard. 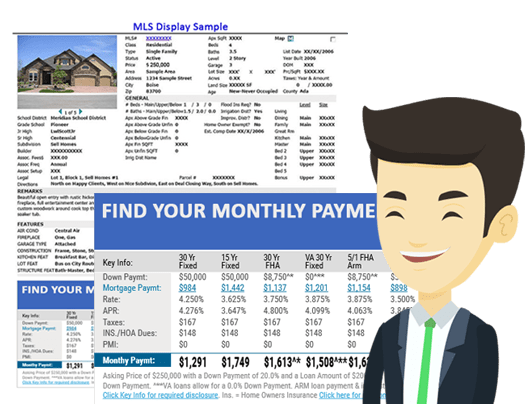 The RatePlug Mortgage Marketing Lender Dashboard helps you connect with agents, create property flyers, manage your usage stats and keep track of your agents’ new listings. With RatePlug, you know what your agents are doing. Your agents get more support when you showcase a property’s affordability calculated from your rates and products. It’s a win/win! Get Started With RatePlug Today. For new originators building new relationships - work with up to 5 of your favorite Real Estate Agents. For originators growing their network - work with up to 12 of your favorite Real Estate Agents. For established originators that work with unlimited agents in multiple MLS systems. All features of PRO plan PLUS. Equip your entire team with RatePlug. Includes centralized rate & product management, team performance analysis, and custom on-boarding.